Heaton was CEO of Shape Arts for 9 years of it’s 40-year history, and is now chair of the organisation. 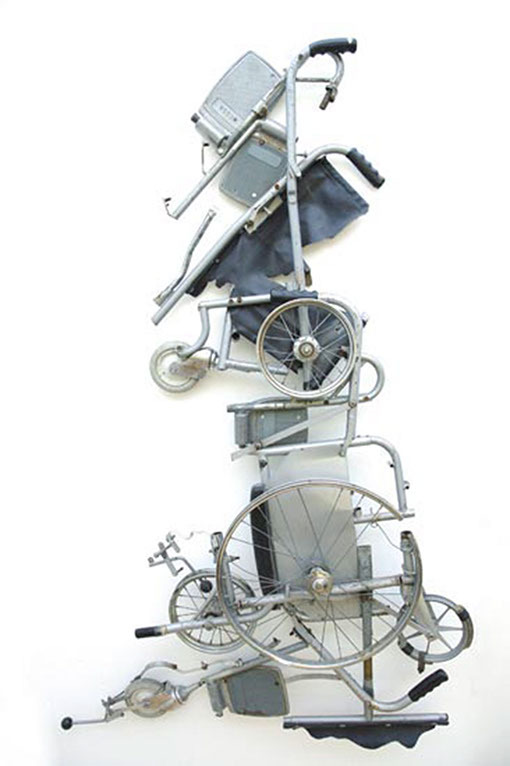 Prior to Shape Tony was the Director of Holton Lee for over 10 years, a disability-led arts organisation through whose doors many Disability Arts Movement artists passed. Throughout the past 30 years Tony has been a practicing artist in the field of sculpture and performance art. This sculpture began, as many do, with a conversation. This particular conversation was with the Curator of the ‘Art of the Lived Experiment’, Aaron Williamson, concerning alchemy, the idea of turning a base metal into gold, turning something of little value into a substance of value, a speculative philosophy. The objective of alchemy, the quest for transmutation, was often primarily aimed at effecting personal change in the Alchemist. 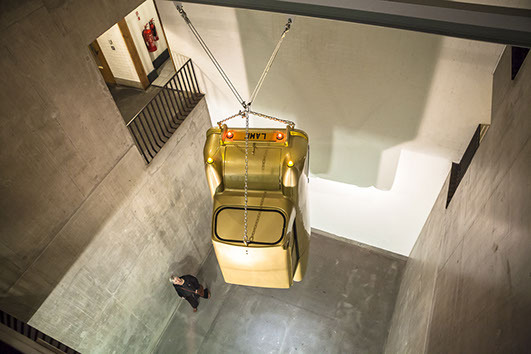 The changing of objects and meaning has been constant within my practice as an artist, and, for this current work and response to the idea of ‘the art of the lived experiment’ I have selected an iconic object, the Invacar, and the notion of transmutation, the effecting of personal change. Its complicated, I transmuted from Biker to Invalid. I was issued with an Invacar in 1971. The Invacar was a societal response, initiated by government, to the lack of access to so-called public transport. The solution was to provide Invalids with a form of very cheap transport, though considered a prosthetic, a medical replacement for legs. An unlined fiberglass shell, 9’.9” long and 4’.6” wide, a single seat, sat on a chassis of three wheels, space for a folding wheelchair, propelled by a small motorcycle engine with a cubic capacity of 197, three gears plus reverse and a maximum speed of around 45 mph. The single seat meant that you travelled alone, the assumption had to be that you had no friends, family, lovers, the solitary cripple, other. They were all painted the same colour, to mark you out as other. A pale blue, NHS Blue, this became know as Spazz Blue. It was banned from motorways. This was clearly stated on all motorway signage. No Invalid Carriages. 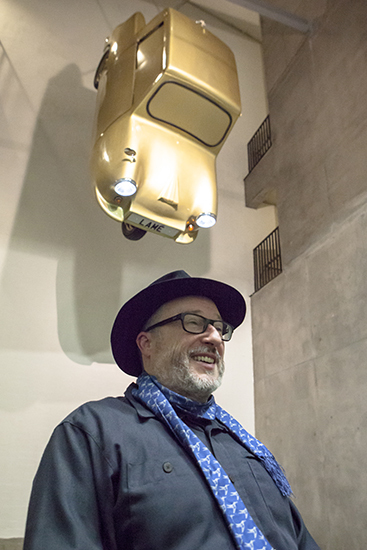 It disappeared from the roads of Britain in 1983, and like all icons can now only be witnessed, restored pristine, in the museum. But this one escaped, suspended, transformed from prosthetic to sculpture, transmuted from Spazz Blue to Gold, Lame to Lamé. Heaton’s 1992 performance of his famous piece, ‘Shaken Not Stirred’, was part of the ‘Block Telethon’ protests. 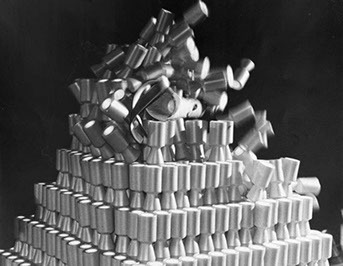 Through the destruction of a pyramid of over 1,000 charity collecting cans, this piece emphasised the needs for social rights as opposed to charity. SHAKEN NOT STIRRED Original performance piece 1992.